Are you thinking of selling your home and want to know its market value? Or, do you own an investment property you want to sell? Our real estate agents provide free appraisals on land, units, apartments and houses. We base our findings on recent sales history, location to amenities and the closeness to shops and schools. We know this region very well and have sold multiple properties in Worongary. We have a database of investors and home seekers that are interested in purchasing property. Are you moving and want to rent out your home? Or, do you own an investment property and are looking for a property manager? Our property management team arrange free rental appraisals on units and houses. We discuss with the owner the length of the lease and the type of tenant that is preferred. Our goal is to maximise your return on investment. We manage many properties in the region. We build a relationship with our landlords. We can find the right tenant to fit any type of property. 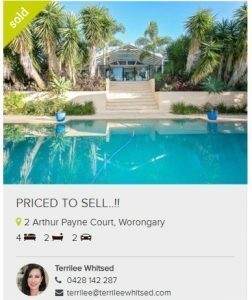 Browse our listings of recently sold homes in Worongary. View houses, units apartments and land that has been sold.